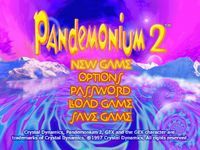 Pandemonium 2 (released in Japan as Miracle Jumpers) is the sequel to Pandemonium, released for PlayStation and PC. a platform game, published by Crystal Dynamics, for the PlayStation and PC. It features Fargus, a pyromaniac court jester, and Nikki, a would-be sorceress, who seek the power from a legendary comet. The goal of the game is to reach the comet as Nikki or Fargus, before the evil Queen Zorrscha does, who plans on using the power to manipulate the world for her further malevolent needs. For each level, the player can choose which character to be. Each has their own abilities - Fargus can deliver a special spinning attack and a Sid attack, and Nikki can double jump, in addition to different abilities gained from picking up powers. The game consists of a great variety of colorful and psychedelic landscapes for each level, as well as a unique gameplay with two-dimensional surfaces twisting and bending in a three-dimensional world. In the PlayStation version, rather than using a memory card as in most PlayStation games, progress is saved using a password system. Source: Wikipedia, "Pandemonium 2," available under the CC-BY-SA License.